Order your firewood for the fall. You’ll beat the winter rush and will also give the firewood the extra summer months to season. If you have wood decks, check them for wear and tear. Consider replacing any loose nails that have popped up with galvanized screws instead. Now is a good time to plant additional annuals. It will soon be Father’s day. Don’t forget to call your dad. If you need a gift but don’t know what to get, try a Woodstock Hardware Gift Card. Visit our Gift Center for more information. If your father or anyone is a do-it-yourselfer, they may be looking for a new hand or power tool. Woodstock Hardware has a wide variety of quality hand and power tools ideal for anyone, whether they’re a novice, a weekend builder, or a professional. We will even explain to you the differences between the tools you purchase at a hardware store and those that “seem cheaper” at a big box store. Visit Woodstock Hardware’s Hand Tools Department and Woodstock Hardware’s Power Tool Department. Order your firewood for the fall. Having firewood delivered now will help you beat the winter rush and will also give the firewood the extra summer months to season. Check and clean downspouts and gutters of any spring debris. Complete any interior or exterior painting projects on your list. June is a good month to plan and complete those exterior painting projects, especially. Decide whether you want to repaint your home the same color or if you want to consider a new color scheme. Woodstock Hardware has more than 2500 custom colors to choose from. Plus, our color-matching computer lets us match and make any paint color. Visit our Paint & Sundries Department. Woodstock Hardware has a wide range of quality paint and painting supplies, and our technical training combined with many years of practical experience ensures you’ll find what you need. So when you plan your next painting project stop by and let Woodstock Hardware help you successfully complete your next project. 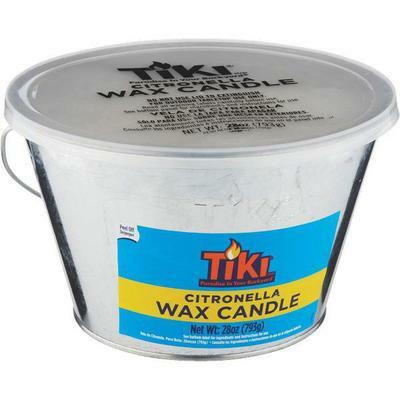 Visit Woodstock Hardware’s How To Tips and our Detailed Information Pages. If you haven’t cleaned the freezer recently, now is a good time to clear out the old and make room for stocking up on seasonal produce from farmers’ markets. Local strawberries are in season. Try making strawberry jam and get all your food freezing projects started. You sure will be glad you did in January when you are enjoying those strawberries. Check water supply hoses on your sinks, washing machine, refrigerator, and dishwasher. If they show signs of deterioration, replace them. A broken water supply line can lead to a disaster. If you have central air conditioning or forced hot air heat, you should be replacing the air filter on your fan unit on a regular basis. Be ready to replace the filter at the end of June. 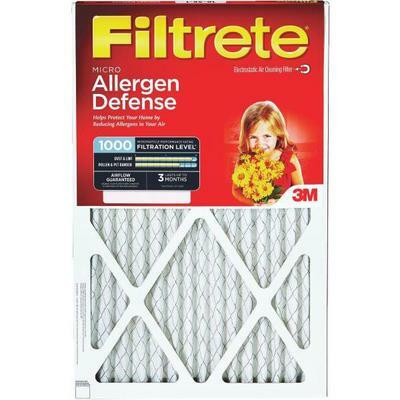 With the air conditioner running for the summer forget those ineffective “cheap” filters and purchase a quality Filtrete filter manufactured by 3M. For less than $20 you can purchase a filter that actually cleans your home’s air. Consider the following simple thought: Particles in the air aren’t just dust. They can include pollen, plant and mold spores, pet dander, lint, and dust mite debris. Some particles can carry bacteria and viruses, and many everyday activities in the home such as dusting, vacuuming, cooking and smoking can increase concentrations of these particles. June is National Safety Month. Take a break from your outdoor projects and make sure your home is safe. Visit the National Safety Council for more information. Does your family have a fire escape plan? If not, sit down together and discuss how you will exit your home in case of fire. Make sure there are two exits from every room. Decide where your meeting place outside will be and at a safe distance from your home. Finally, and most importantly, rehearse your fire plan and work out the bugs. To really make sure it works, execute the plan a couple times once your children are asleep. It will freak them out at first, but they’ll get the confidence to quickly escape if they have a chance to practice. Woodstock Hardware has a complete line of products to make your home safe for you and your family. Whether you need a lead test kit, child safety devices, a new smoke alarm, or a fire escape ladder, Woodstock Hardware can help. Visit Woodstock Hardware’s Home & Office Safety Department. Clothes dryer vents should be checked at least once a year to make sure they are clear of any lint buildup that could cause a fire. If you use the Scotts Four Step lawn care system, it is time to apply Step 3. Inspect all of your recreational equipment and make sure it’s in good repair. Make sure the fence and gates surrounding your swimming pool are secure. If you have wood decks, check them for signs of wear or deterioration. Repair or replace as needed. If you have nails popping up, consider replacing them with galvanized screws instead. Check exterior railings and stairs. Repair if they are loose or showing signs of wear. 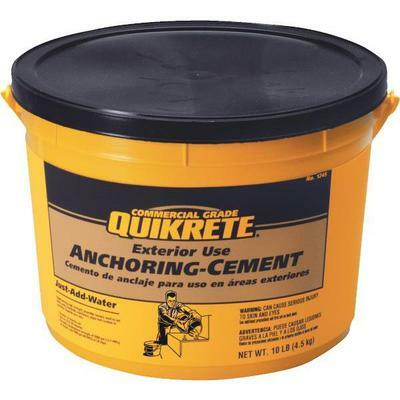 Anchoring cement can be used to repair those loose posts that are set in concrete. Depending on the year, it may be necessary to water your gardens. Consider drip irrigation systems, soaker hoses, or traditional sprinklers regulated by water timers as alternatives to automated, underground sprinkler systems. Stop in and let us show you our garden watering alternatives. Replace any broken or worn out gardening tools. Continue to weed and fertilize your gardens. 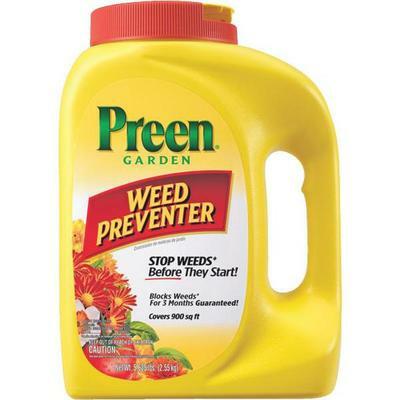 You may want to consider a fertilizer product such as Preen and Weed to accomplish both. There are both traditional and Green alternatives for spray weed killers available.